Alas, there are no specific instructions on just how to change the redirect. For those not familiar with the way these things work, I wanted to amplify his fix. First, open a command window in administrator mode. I used the one that came with Visual Studio (the Developer Command Prompt for VS2012). Next, change directory by using the “cd” command to the first item in the list above. (Click on the pic for a bigger image, should you have poor eyesight). Using the DIR command, we can see one directory with a version number followed by what appears to be a hash value of some type. Issue another CD into that folder. Use notepad to edit the one with the .config extenstion. Simply change the number in the newVersion from 12, to 11. Repeat the steps for all four of the folders in the list above. Next, and this is important kids, you need to stop and restart your SQL Server 2012 Reporting Services service, or simply reboot the computer. After that, your SSRS 2012 Report Manager should start to behave normally again. I’ve also tested the 2014 Report Manager, and it seems to work fine after the changes were applied. (In theory it shouldn’t have been affected, but you can never be too careful). If you found this post useful, do us a favor. Go to the Microsoft Connect article linked at the top and give it an up vote, so Microsoft will begin to take notice. Also thanks again to Brian Judge (whom I do not know but hope to meet) for filing the original bug and giving the clue to fixing it. Inside are three files, a PDF of the slide deck, the MDX script I ran, and the analysis services database as a backup file (abf) that you can restore to a server on which you have administrative rights. This sample was created in SQL Server 2012, although should work on 2014 and (although I haven’t tested) should work on 2008R2. The steps are pretty straight forward. 1. First, if you have Visual Studio open, close it. 2. In the classic Windows menu go to Start, All Programs, Microsoft Visual Studio 2012, Visual Studio Tools, and right click on the “Developer Command Prompt for VS2012” and pick “Run as administrator”. If you are in Windows 8 or Server 2012 or later, probably easiest to just do a search for “Developer Command Prompt for VS2012”. 3. Navigate to Visual Studio’s Private Assemblies folder by entering “CD C:\Program Files (x86)\Microsoft Visual Studio 11.0\Common7\IDE\PrivateAssemblies” (If you have installed VS to another drive or folder, adjust the path accordingly). 4. 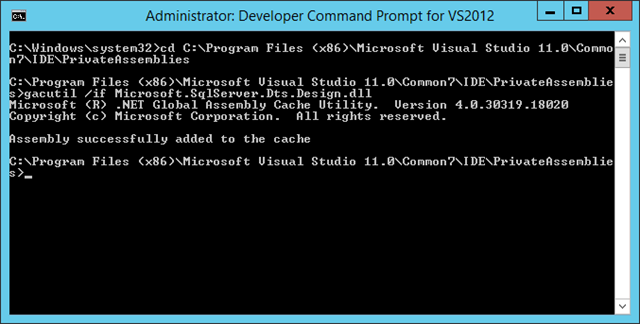 Enter the command “gacutil /if Microsoft.SqlServer.Dts.Design.dll” into the command prompt. Now you should be able to open your SSIS projects. The dll is the main set of libraries for SQL Server Integration Services. For some reason, after certain Windows updates, this becomes deregistered and you have to manually add it back. Not a huge deal, but annoying if it happens often enough. As I just had it happen today after a Windows update to the Hyper-V VM I use for some of my SQL Server development, I wanted to post this as a reminder on how to correctly fix the issue.